Library Card = Upcoming book reviews! I’ve lived in Seattle since September 2011 but since I moved here for grad school (master of occupational therapy) and did plenty of book learning there until December 2013 it took until now for me to get my Seattle Public Library Card. 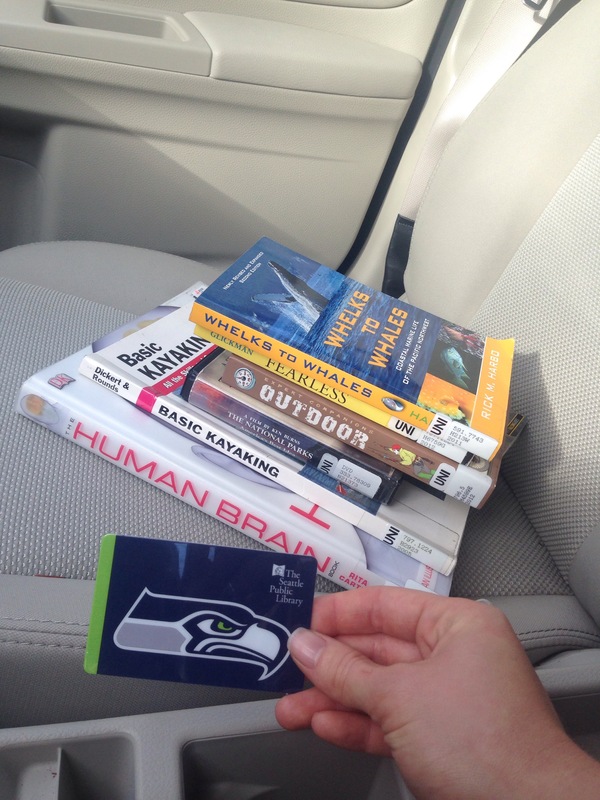 Which was perfect timing since they have the limited addition Seahawks library card right now!! I immediately started looking for kayaking books (and found a book on the human brain, one of my other favorite topics, especially with pretty pictures). So if you also love reading about kayaking (whether it’s how-to, biographical, species identification, more in depth on a topic, etc.) stay tuned! And don’t worry, I won’t review ALL the books I read, like my brain books, comics (my friend told me graphic novels sounds better), sci fi novels, etc.